This is an excellent satire on modern technology. Winnie neglects her cat, who is outside staring mournfully through the rain-drenched window, whilst she orders a new wand and surfs the web at www.funnywitches.com (no, it isn’t a real website. We checked!) Wilbur even moans that ‘that mouse has put a spell on her’. How many parents are similarly addicted to their gadgets? 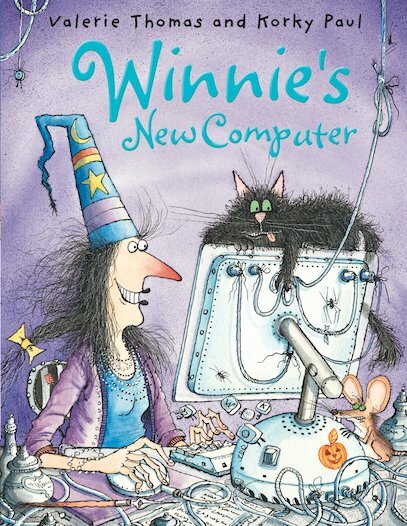 There is also the inevitable disaster when Winnie throws out her wand and book in favour of doing everything on the computer and finds herself without a back-up. It’s a simple and oft-repeated argument that we rely too much on technology at the expense of traditional methods of doing things, and perhaps that argument is nothing new, but in a children’s book it’s a great way to start a debate with young children about over-reliance on computers. 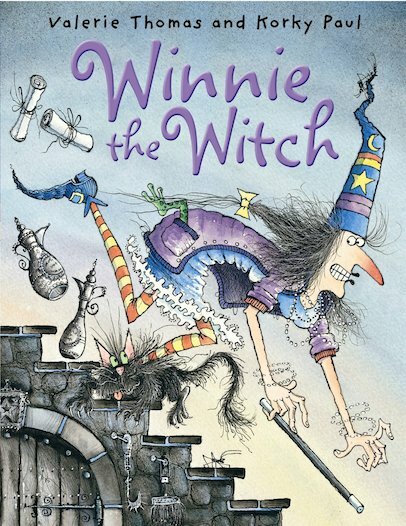 Last week marked 25 years since the publication of Winnie the Witch. The hapless character has been entertaining young children since 1987, putting her on her second generation of readers. Winnie was created by Australian writer Valerie Thomas and illustrator Korky Paul. The latter was born in Zimbabwe and studied in Cape Town before coming to Europe in the seventies. He now lives in Oxford although spends a lot of time in Greece. With such a multinational background it is hardly surprising that Winnie the Witch has been translated into ten different languages and enjoys international success. There are now seventeen Winnie picture books, as well as some longer chapter books for older readers, but it is the original that has the most enduring charm. Winnie lives in a completely black house. The walls are black, the carpets are black – even the bath and the bed are black. This wouldn’t be a problem but for Winnie’s cat, Wilbur, who is also black. Provided Wilbur sits somewhere with his green eyes open, Winnie can see him. But the moment he closes his eyes and goes to sleep, he is practically invisible. Poor Winnie is constantly sitting on him and tripping over him, until one day in desperation she grabs her magic wand and turns him green. Now she can see him! Or at least she can until he goes outside in the grass, when he disappears completely…. It is a clever and funny premise, and Winnie’s efforts to solve her problem are of course unsuccessful. In fact, she upsets Wilbur so much that he retreats to the top of a tree and refuses to come down. Forced to come up with a better solution Winnie eventually hits on a real brainwave, an answer that fixes everything and brings the two friends back together again. Korky Paul (whose real name is actually Hamish Vigne Christie Paul – I can’t be the only one who’s always wanted to know that!) has created a loveably unattractive character in Winnie, with her red nose, scruffy hair and bent hat. The detail in each drawing does not detract from the impact of the whole picture and the scribbled, hurried style (reminiscent of Quentin Blake) is highly evocative. The text is also well-written, full of repetition, patterning and simple, fluent sentences. The occasionally awkward moments imitate the colloquialisms of oral storytelling and the way in which children speak to one another. “When Wilbur sat on a chair with his eyes open, Winnie could see him. She could see his eyes, anyway. But when Wilbur closed his eyes and went to sleep, Winnie couldn’t see him at all. So she sat on him. When Wilbur sat on the carpet with his eyes open, Winnie could see him. She could see his eyes, anyway. This is a classic with lasting appeal and a genuinely funny storyline.